B cell–induced proteinuria generated foot process effacement. 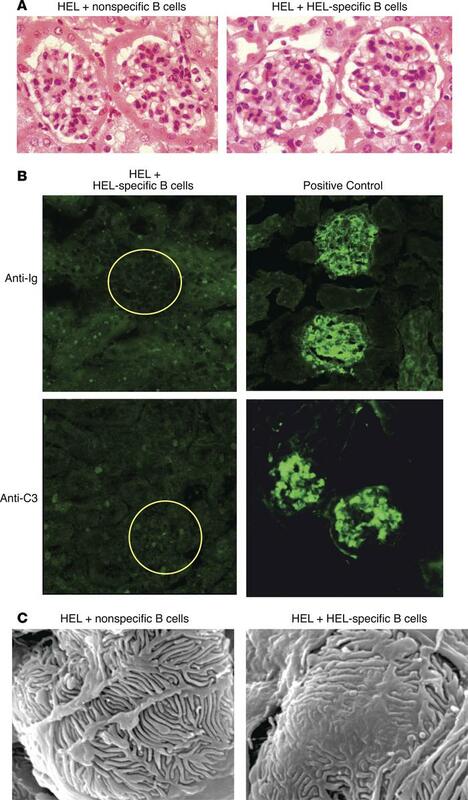 (A) Representative light microscopy of H&E-stained kidney sections from mice with B cell–induced proteinuria revealed no pathologic changes. Original magnification, ×40. (B) Representative immunofluorescence microscopy images of kidneys from mice with B cell–induced proteinuria (left) did not demonstrate immunoglobulin or complement component C3 in glomeruli compared to positive control nephrotoxic serum (right). (C) Representative scanning electron microscopy from kidneys showed focal foot process effacement in mice with B cell–induced proteinuria (right) compared with control mice (left). Scale bar: 10 μm. Data are representative of 3 independent experiments.